PLEASE NOTE THAT THE SMRT33P MODEL HAS BEEN DISCONTINUED. WE WILL CONTINUE TO OFFER THE SMRT33N MODEL FOR YOUR RELAY TESTING NEEDS. For size, and low weight, the SMRT33 is conceivably the smallest, lightest, highest output powered; complete three phase relay test system in the world today. The SMRT33 provides high power in BOTH the voltage and current channels to test virtually all types of protective relays used in heavy industrial, distributed generation and low to medium voltage distribution substations. The SMRT33 has the “smart” combination of high compliance voltage and high current to test all electromechanical, solid-state and microprocessor-based overcurrent relays, including high impedance directional ground overcurrent. In addition, the unit includes capability to test IEC 61850 devices. 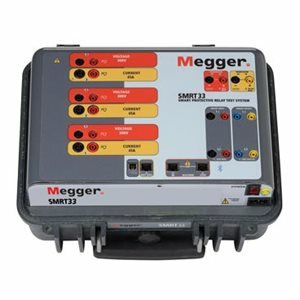 The SMRT33 test system has the ability to be manually controlled with Megger’s new Smart Touch View Interface™ (STVI). The STVI, with its large, full color, high resolution, TFT LCD touch screen allows the user to perform manual, steady-state and dynamic testing quickly and easily using the manual test screen, as well as using built-in preset test routines for most popular relays (see STVI datasheet for details). The STVI eliminates the need for a computer when testing virtually all types of relays. Menu screens and touch screen function buttons are provided to quickly and easily select the desired test function. Tests results can be saved to the STVI for download to a memory stick to transfer or print test reports. For full automatic testing the SMRT33 may be controlled by Megger Advanced Visual Test Software (AVTS). AVTS is a Microsoft® Windows® XP®/Vista™/7/8 compatible software program designed to manage all aspects of protective relay testing using the new Megger SMRT33, (see AVTS datasheet for details).